First, a recap from yesterday…. I was at a workshop all day yesterday, and by the time dinner rolled around, I definitely felt hungry, but not super hungry. I hadn’t gotten my peanut butter fix in for the day yet and decided that sounded just perfect given my hunger status. If I don’t get PB for breakfast or lunch, why not get it at dinner? 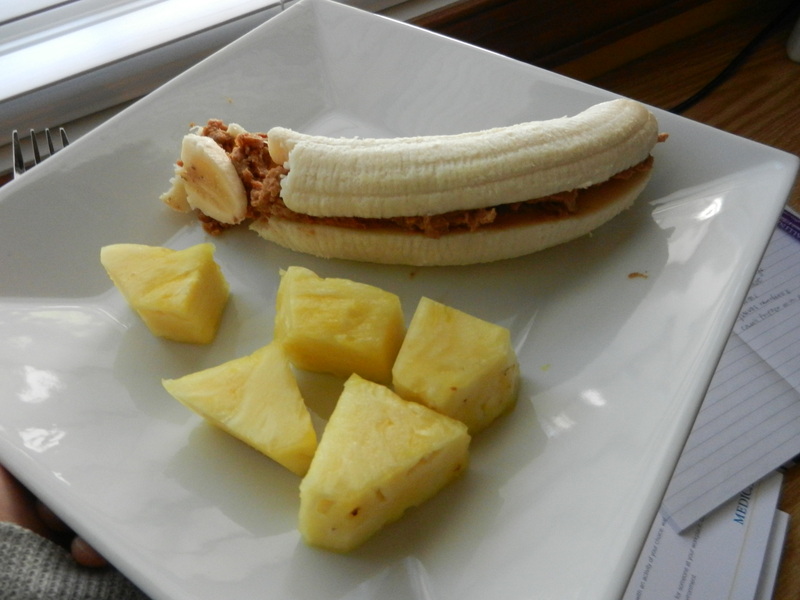 I opted for my classic cinnamon PB2 and banana sandwich, and fresh juicy pineapple. While I was eating my lame dinner, Dana was off in the kitchen creating a masterpiece. 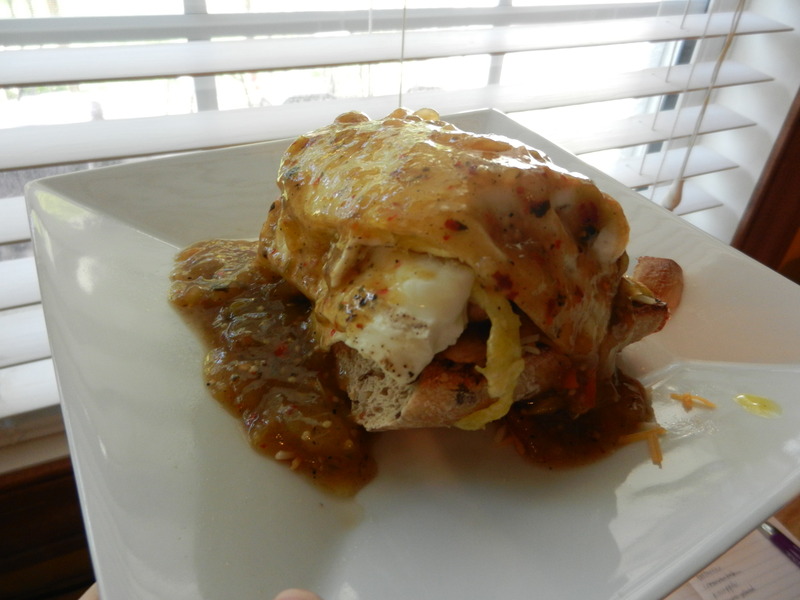 He cooked two eggs over easy, sautéed a handful of mushrooms, and plated his dish as such: toasted whole grain baguette on the bottom, then the mushrooms, eggs, shredded cheddar cheese, and lastly roasted tomatillo salsa. After dinner we took the bear (Moose) out for a walk to soak up what was left of the beautiful day. After sitting on my hiney all day at work, it felt great to stretch the legs and fill my lungs with fresh air. Later, we made a quick stop over at Dana’s parents to check out a light fixture and say hi, and then just so happened to “stumble upon” a self-serve frozen yogurt shop afterwards. When I say stumble upon, I mean we intentionally planned on going there and I was more than a little excited about it. 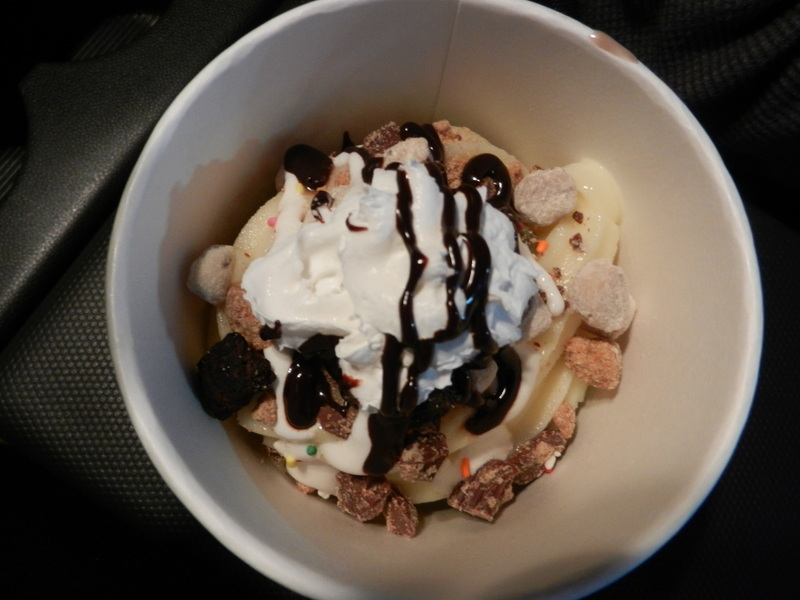 We went to Cherry Berry and I served myself Cookie Monster flavor and Cheesecake flavor, and then topped the frozen yogurt with cookie dough bits, brownie bits, Reese’s peanut butter cups, a few mini gummy bears, sprinkles, marshmallow fluff, whipped cream, and a little chocolate syrup. This baby was on point. Oh yea…I’ve said it before but I wish I could eat this every day. I’m in trouble because we have two frozen yogurt shop’s coming to our neighborhood soon. Good thing it’s not free or else I’d be in real big trouble. It does tend to add up pretty quick as they charge you by the ounce, so that should help keep me out. Tee hee. We got home and I pretty much crashed. 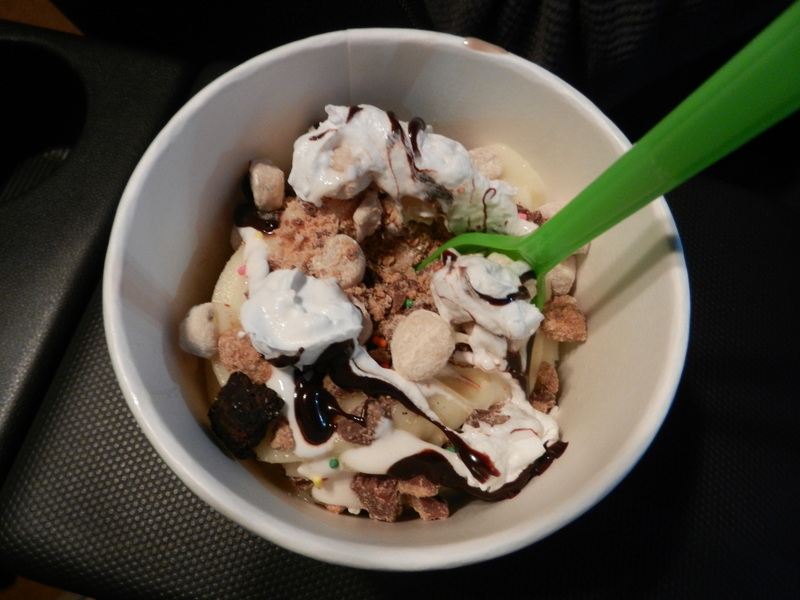 An evening with a beautiful walk and amazing frozen yogurt is a great night indeed. Something happened this morning that hasn’t happened in a pretty long time. I GOT AN EARLY MORNING RUN IN (albeit inside because I’m too much of a scaredy cat to run outside in the dark by myself)! A while back I posted about all the positive’s associated with early morning workouts, and have noticed that since then, they have become few and far between. 1. Now that it’s lighter out later, I feel I have more time after work to be productive and workout. 2. It’s been darker in the morning which is completely un-motivating in terms of getting out of bed. 3. I refuse to run in the dark outside early morning or late evening so I have to face the dreadmill. 4. My early morning runs are usually not as successful as my afternoon or later morning runs (I tend to take it slower in the early am) therefore discouraging me from even attempting. The run this morning was pretty ugly. I felt like each of my lungs weighed 50 pounds and my side was aching, but nevertheless, I finished three miles and am proud of myself. The endorphins are flowing and I am ready to face the day. 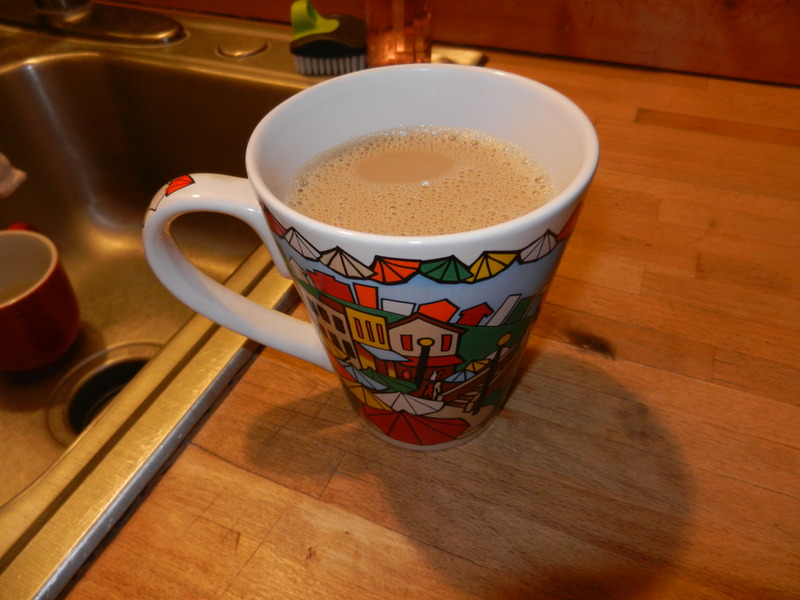 This doesn’t mean I didn’t reach for the large mug for my coffee this morning because I most definitely did…. I’ll leave you with that. Have a great Thursday! This entry was posted in Dinners, Sweet Treats, Workouts and tagged Bananas, PB2, Running, Yogurt by Melanie. Bookmark the permalink.